Chocolate-dipped strawberry hearts are an easy Valentine's Day candy everyone will love! If you thought candies have to be complicated or time-consuming to be cute, think again. 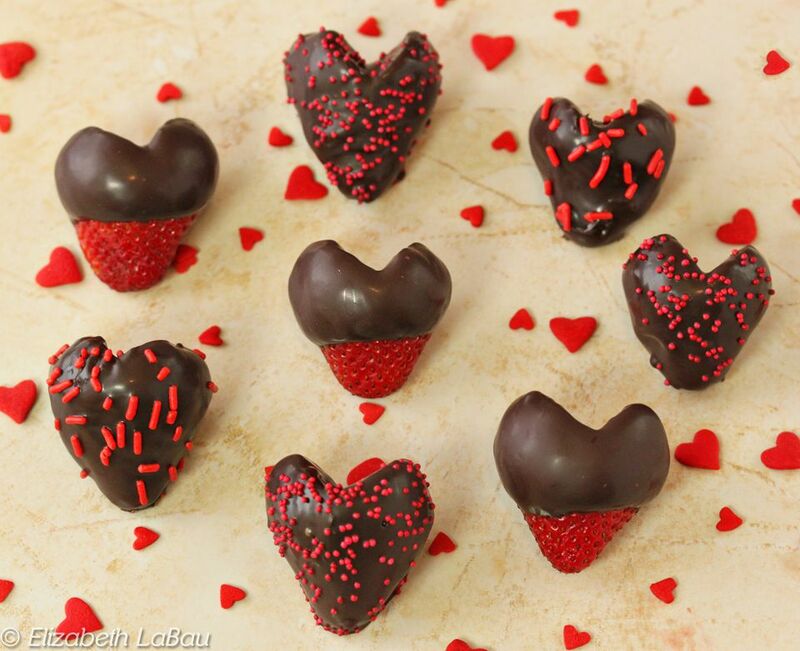 All you have to do is cut strawberries into a heart shape, dip them in chocolate, then enjoy a delicious, beautiful treat! Top them with nuts, coconut, or your favorite Valentine's Day sprinkles to make them really special. This recipe calls for candy coating, which stays hard at room temperature and provides a nice shine. You can use real chocolate if you prefer, but it has a tendency to get soft at warm temperatures, so if you want to use real chocolate, either keep the berries chilled until serving, or consider tempering the chocolate. Prepare a baking sheet by lining it with aluminum foil or waxed paper and set aside for now. Wash the strawberries and dry them carefully, as excess water can interfere with the dipping process. Use a sharp paring knife to cut out the stem of the strawberry in a sharp V-shape, so that the top of the strawberry looks like a heart. Repeat until all of the strawberries have been shaped in this way. Use a paper towel to gently pat the cut portion of the strawberries, to absorb extra moisture. Too much liquid can cause the chocolate to seize, so try to get the strawberries as dry as possible. Melt the chocolate candy coating in the microwave, stirring after every 30 seconds to prevent overheating. Stir until the chocolate is completely melted and smooth. For a partially-dipped look, hold a strawberry by the bottom tip and dip most of it in chocolate, leaving about a half-inch of the bottom un-dipped. Let excess chocolate drip back into the bowl, then place the berry on the prepared baking sheet. Sprinkle the dipped strawberry with nuts, sprinkles, or other decorations while the chocolate is still wet. Your chocolate-dipped strawberry hearts are now ready to eat! They will keep in the refrigerator for several days, but I think they are best the same day they are made. If you do save them for 2 to 3 days, expect to see some condensation on them as they come to room temperature. For a fully dipped look, submerge a strawberry completely in the chocolate. Use a fork or dipping tools to remove it from the chocolate and let the excess drip back into the bowl. Use the fork to set it down on the baking sheet. Repeat until all of the berries are dipped in chocolate. Place the tray in the refrigerator to set the chocolate.